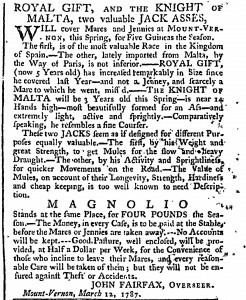 Mary Wigge, a research editor with The Financial Papers of George Washington, posted a fascinating piece yesterday in their project blog on George Washington’s Spanish donkey, Royal Gift, a gift to Washington from King Charles III of Spain. Now, you may not usually associate donkeys and George Washington, but Washington was largely responsible for the development of the Mammoth American Donkey (also known as the Mammoth Jack or American Mammoth Jack), an important breed not only for the work they performed, but their use in breeding mules. Mules are the off-spring of a male donkey (jack) and a female horse (mare). They are infertile, so having good breeding stock is important. Even more than horses, mules and donkeys provided the “horse power” that ran America, indispensable for agriculture, transportation, and the military. This piece is even more interesting to me because of John Jay’s involvement. 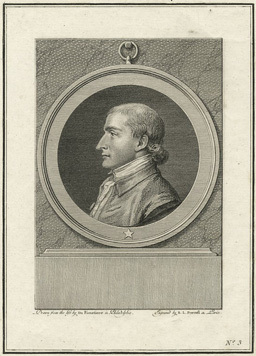 While serving as Minister to Spain during the Revolution (a mission explored in volume 2 of The Selected Papers of John Jay), Jay wrote home to his father, Peter, describing the agriculture and manufactures of that country. While he had much negative to say about Spain’s inns and social inequality, he greatly admired the quality of the horses, asses, and mules. It is a prevailing and I believe a just opinion that our Country would do well to encourage the breeding of mules, but the Difficulty of obtaining good male asses, as yet, much retards it. as you have one of the best kind, would it not be useful to put him to some of the best females now in the Country, and by that means obtain at least a tolerable Breed of asses. The few that I have seen are indeed very small, and it is to be wished that two or three Females of the largest Size could be imported; for we might then soon have from yours as good a Race of those animals as any in the World. 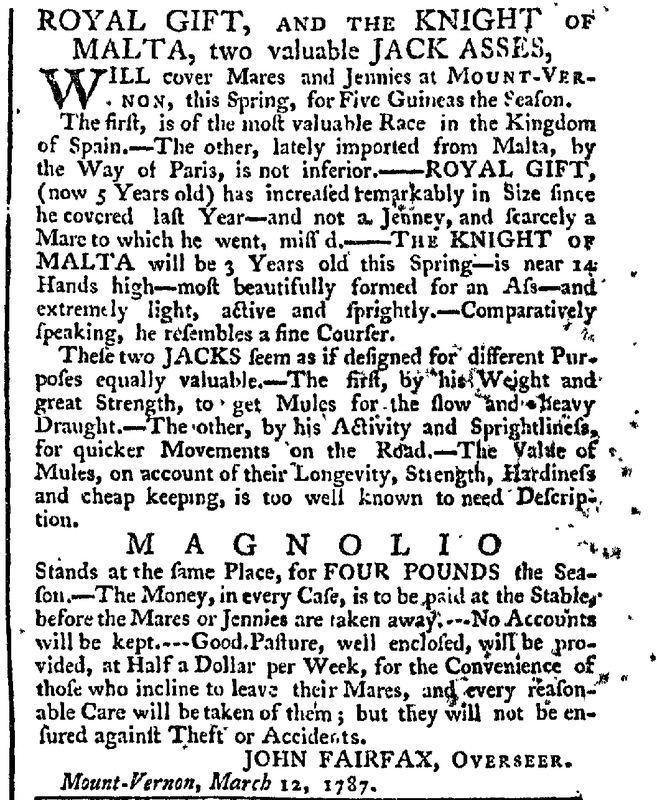 I have two imported female asses from the Island of Malta; which, tho’ not quite equal to the best Spanish Jennies, will serve to establish a valuable breed of these animals in this Country.– Besides, I have dissiminatd the breed of my Spanish Jack to many of the smaller kind of this Country.– And if you have one of these, or a better sort, and should think the trouble of sending her here not too great, she shall have the free use of the Jack–every necessary attendance–and I shall have a great pleasure in obliging you. As yet to say that we have no four footed asses in this State and I sincerely wish we could exchange some of the other Sort for those wd. be saying too much– of the right Sort we have none I wish we wd. exchange a few of them for Jacks & Jennies we might then obtain a much more Valuable Race of mules than those we now have. Jay, Washington,. . .and donkeys and mules?